All volunteers arriving in Thailand will be met by one of our staff at the airport. You can choose to fly to either Krabi or Phuket. If you fly into Phuket, you will be asked to pay a supplement fee for your round-trip airport transfer. If you arrive in Phuket, you will usually spend one night in Krabi before traveling to your accommodation with a member of local staff. Most volunteers change planes in Bangkok and it is worth checking before starting your journey if you should collect your luggage in Bangkok and re-check it for the flight to Krabi or Phuket, or if it will go straight through. 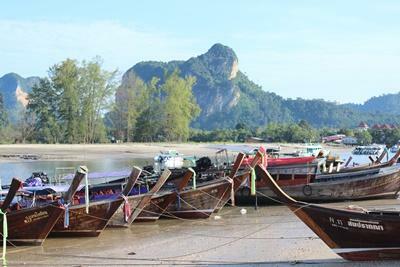 Some volunteers choose to travel to Krabi overland, especially if traveling in Thailand before joining one of our projects. This is not a problem; we will simply put you in touch with one of our local staff to arrange meeting you at a hostel or the bus station in Krabi for example. From the airport we will take you to your accommodation. Volunteers on the Conservation Project live in shared bungalows at a resort in Ao Nang, about 20km from the airport. The resort has air conditioning, Wi-Fi, and a pool that volunteers can use. Typically, volunteers on our Care and Teaching Projects live with local host families, but you can also choose to stay at the resort, even if you are not participating in the Conservation Project. Your room will be a welcome sight after the long flight. You'll have several hours to rest and we'll begin to arrange a schedule with you for the next few days. Normally this time is spent with other volunteers and our local staff, travelling to the location of your placement, getting an induction to your local area and learning how to get around. If you are volunteering on a Standard Project, all necessary work-related transportation costs will be covered by Projects Abroad. If you are taking part in our Conservation & Environment Project, you will be introduced to the other volunteers and staff when you arrive at the resort, and have an orientation to the area before commencing your diving course and getting started on the other activities. All volunteers participating on standard projects in Thailand have the opportunity to spend one week on a Conservation & Environment project at the end of their main placement. For more information, please visit our Diving & Marine Conservation & Environment Project in Thailand page. Our Combinations Page explains how you can combine not only projects, but also destinations.